Our customer was experiencing significant product spillage issues causing the trough rollers at the transfer point to seize and wear out prematurely, pictured here below. 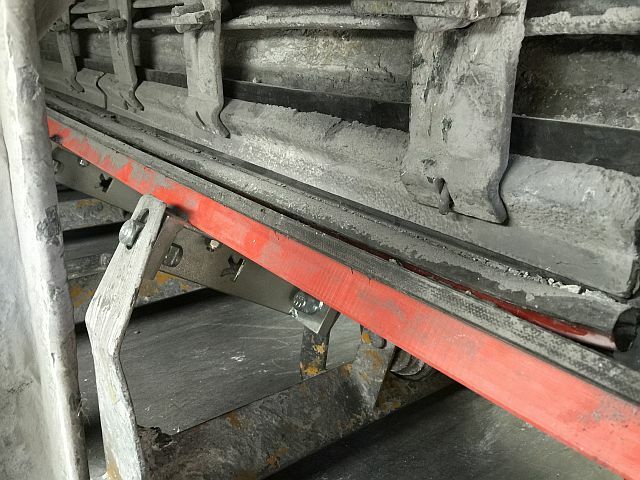 This is a common problem experienced at transfer points where the force of the conveyor feed through a drop chute from another conveyor, causes belt edge sag in between belt supporting rollers. Not only is there spillage, but the skirting arrangement present wears prematurely and a dust hazard is created. The problem was effectively resolved by replacing the existing impact wing rollers under the transfer chute with our, K-Sure® Belt Support System. This belt support configuration utilises a series of low friction polymer slider bars. K-Sure® Belt Support’s universal adaptor brackets are then arranged to the existing frame and assembled precisely to suit the conveyor’s troughed belt profile. The System requires no pre-engineering, adjustments or special tools and the outcome has successfully removed the occurrence of belt sag. Now there is no spillage to clean-up, and the already present K-Ultra Dual® Seal can effectively contain the blow-out pressure of the dust particles. Pictured here is the spillage-free transfer point area, the Kinder “K” universal bracket’s, K-Sure® Belt Support’s red polymer slider bars. K-Ultra Dual® Seal was pre-existing, but now functions as it was intended and controls dust particles from becoming airborne.